< I’ll share my journal…. What absolutely beautiful words. They really touched me, thank you. I’m so glad, Heather! Thank you for that very kind comment. Happy Mother’s Day to you! I am very blessed to be the mother of four children, all grown up, and now the grandmother of seven grandsons and a baby grandaughter. WOW!! You must be a very busy woman! I only have my one girl, who graduated college last May at this time, and now lives in another state, working for the college from which she graduated. This is my first Mother’s Day without her, although we will see her soon. Sending love to you and your family; I’m so glad you enjoyed the poem. 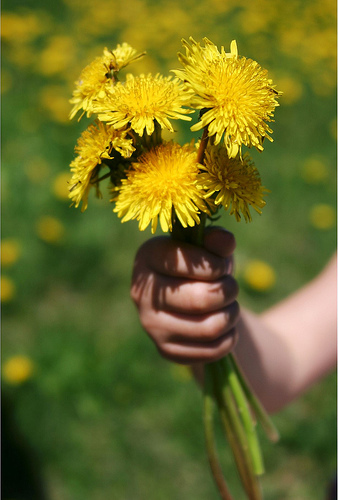 You’ve probably had many “dandelion moments” with your growing family. Peace and happiness to you, and have a wonderful day today. Thank you, Jodi, and the same to you!! Thank you so kindly, Kathy! Happy Mother’s Day to you! Thank you Laura, you have touched my heart. My own mother passed away this last Thursday so this Mothers Day is very special to me. Laura, that is lovely. You’ve expressed a lot of what I feel when I look at my teen daughters…the potential, the love. very well said. thank you. Happy Mother’s Day! It was an art day, Jean; therefore, it was wonderful! Thank you so much, and I hope you had a wonderful Mother’s Day as well! Thanks, Rebecca! And the same to you!